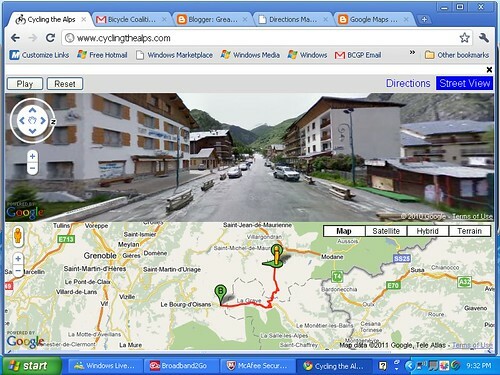 The Google Maps Mania blog recently highlighted Cycling the Alps, an interesting website dedicated to cycling the passes of the Alps. The website has added Google Streetview movies to some of the rides. The most notable is Col-Du-Galibier pass which is often the highest pass on Tour De France. The Googlemobile passes many cyclists on the route and you can see the chalk messages on the road. The route is just east of Grenoble which was the site of the 1968 Winter Olympics. So if you have decent monitor and a stationary bike start the tour and enjoy the climb. The tour takes about 40 minutes at the default image speed. You can a Street View movie of your own bike route using the Directions Map widget wizard. This is really neat! I wish I had this at my disposal when I crossed the Alps back in 2001 on an unsupported 9 week tour. Then I used Francis & Sheila's VIRTUAL ALPS (http://aukadia.net/alps/index.htm) which had me dreaming of crossing dozens of passes. I didn't have a chance to look at it too closely but I wonder if there are descriptions of passes that are closed to motor vehicle traffic but could be passable by bicycle. That was one thing I wish I had more info about on my tour. Also, I don't have any Cabin Fever as I've been XC Skiing like mad up here in Central Jersey. I've gone so much that I'm actually starting to get good at it! I just did this. Sitting on my Tacx and cycling the Col du Galibier in 40 minutes. This made a lot of fun. There are about 20 streetview tours available at the moment. A really cool way preparing myself for Cycling in the Alps!